Dickie Scruggs may not be the person that you ever want to imitate your career after, we mean, like, ever. He was convicted of bribing a federal judge, was disbarred and sent to prison. We agree that part is not exactly a success story. His real success comes after he was released from prison. Oxford Magazine wrote an article on his life now, post-prison and scandal. In late 2007 the FBI raided Scruggs’ office, he faced (and was ultimately convicted of) a federal judicial bribery charge. Not only that, his addiction issues spilled out into the public light during it all. Richard Scruggs has not had an easy road, himself being the largest obstacle at times. But from the whole negative experience, he says he has learned so many things. He also states,”I’m happier today than I have ever been before,” how is that possible? Mr. Scruggs has left the terrible times as far behind in his mind as he can and focused on the future. But there is more than that. He let that difficult time lead him to a better place in his life. One where he let his family in and started to give back to the community around him. When you have undergone a difficult time, has it made you a better person? Perhaps put you in a better place? We would love for you to share on our Facebook page here. 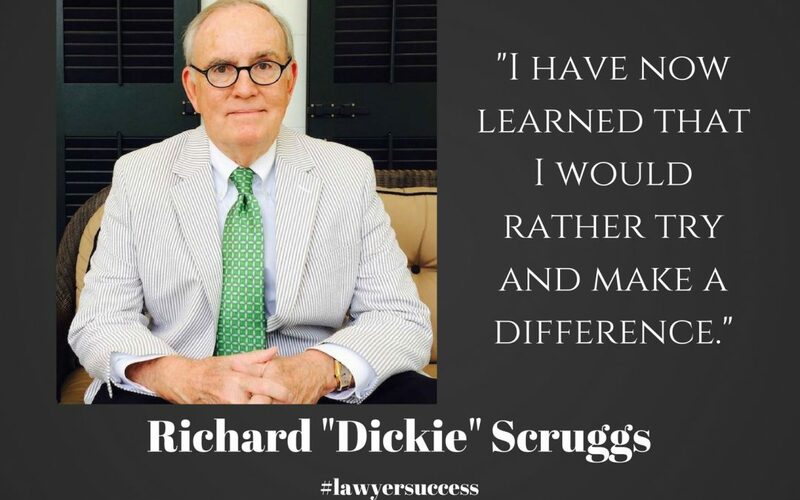 Dickie Scruggs shares one of his favorite quotes from Gone with the Wind:”Until you’ve lost your reputation, you never realize what a burden it was or what freedom really is.” So no matter what you lose, keep your focus and let it drive you to a better place. To see where much of this information came from and to read the best article I’ve enjoyed in awhile click here. This article was written by Michelle Cady-Cook. She is the Director of Marketing and part owner of Cady Reporting (a WBENC company). She is a sustaining member of the Cleveland Association of Paralegals and is currently serving as Chair of the Cleveland Metropolitan Bar Association Green Initiative Committee and Chair of the Follow Up Committee for the National Network of Reporting Companies (NNRC). She has been officially involved in the legal community for over 10 years. Within the framework of Cady Reporting Services, she partners with locally owned court reporting firms across the country to continually improve the practice of litigation. Cady Reporting Services is located at 1468 W. 9th St. Cleveland, OH 44113. Our court reporters and videographers personally serve the state of Ohio, and we daily schedule court reporters and other litigation support services through our partners in the NNRC. The National Network of Reporting Companies is your personal connection to coverage wherever and whenever you need it.